Castle Comfort Stairlifts offers top brand stairlifts, keen prices and fast installs for all those seeking stairlifts in Dudley, West Midlands . And all work comes with our no-quibble guarantees and famous customer service satisfaction. Dudley is the unofficial capital of the Black Country aka the West Midlands or that is the rough boundary. Almost 1000, well 983 of the retired folk of Dudley already have stairlifts. Castle Comfort Stair Lifts know this because of our rolling stairlifts statistics counter at the bottom of our home page which is updated every minute; about 2.6% of the retired population of Dudley own stairlifts. We supply a wide range of stairlifts from straight and curved even to perch lifts for those who are not able to sit. We can install in an hour or at the most half a day and our after sales service is second to none. If you’d like to know more please give us a call at our West Midlands office on 01902 489 422 . · Did you know that Dudley was hit by an earthquake only last November? Just after midnight on 12th November a small earthquake hit Dudley with a magnitude of 1.5 – so tiny. In fact there are 8,000 recorded earthquakes with a magnitude of 1 – 2 everyday around the world! In the UK earthquakes normally occur on the western side of the UK mainland. · Dudley is the largest town in England never to have had a football team in the league tables! · Topically Dudley has applied to receive the status of ‘city’ in this year of the Queen’s Diamond Jubilee (2012). The towns – 25 have applied including Reading, Bournemouth and Gateshead – which have been awarded the status of city will be announced in June 2012. There are several explanations though none are clarified as to why the area of the West Midlands came to be called the Black Country. The most common is that as a result of the production of coal in the area and the industrialisation with iron foundries and steel works burning the coal in the 19th century, the area was left covered in a layer of black soot. Some historians think it may go even further back as ‘scars’ of black coal could be seen on the heath lands and with coal so near the surface, the earth in the area was extremely black. As Queen Victoria passed through on the royal train, she is said to have asked for the blinds to be pulled down in her carriage. There is no evidence that this is true! Dudley is slap bang in the middle of the Black Country with Walsall, our next destination and Sandwell. Dudley is the largest town in the Black Country too hence earning the unofficial title of Capital of the Black Country. The West Midlands covers a broader area taking in Birmingham, Wolverhampton, Sutton Coldfield, West Bromwich, Solihull, Stourbridge and Halesowen as well. Dudley is one of the towns where we hear the famous West Midlands accent. There are still elements of a local dialect in different parts of the West Midlands usually undetectable other than to locals! The accent referred to is perhaps best explained as pronouncing singer to rhyme with finger, bath with math and put with cut! Here at Castle Comfort Stair Lifts we don’t mind what your words rhyme with! All we’d like to do is help you regain some of your mobility to get you up and down those stairs. We can advise you on the best stairlift for you and your home without bias as we supply stairlifts for all the UK’s manufacturers. 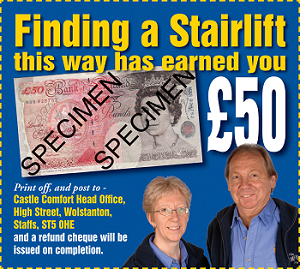 Assessing your home to see which stairlift will work best for you is all part of our service. Take a look at the short video of our founder Keith explaining how he became interested in supplying stairlifts and if you still have any questions, we are here to answer them. Just call our local office on 01902 489 422 . Built in the Norman period, there are only ruins of Dudley Castle left now. In its grounds however there is a flourishing zoo. Dudley Castle was the home of the Dudley family (formerly Sutton) who took the name from the castle. The most famous Dudley was John who rose in the ranks of the court of Henry VIII to become the Duke of Northumberland. On Henry’s death, the Duke became protector to the young King Edward VI. After his early death, the throne was left open for Henry’s eldest daughter Mary. 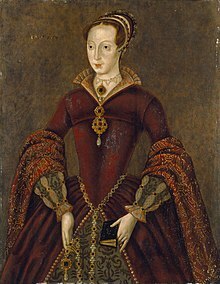 The Duke conspired to put his daughter-in-law Lady Jane Grey on the throne without success. As a result he was executed along with his son and Lady Jane Grey. More recent than Lady Jane Grey, famous people from the area include comedian Lenny Henry who was married to Dawn French and the long-haired singer in the X-Factor, Wagner Fiuza-Carrilho. Footballer now manager for West Ham Sam Allardyce is from Dudley. Busby Babe Duncan Edwards who tragically died in the Munich Air Disaster was also born here. There is a statue of him in the town. Nearby Halesowen was the home of composer Leslie Bridgewater and George Eliot the famous 19th century author comes from Arbury. The Museum houses a collection of local fossils found at Wren’s Nest a nearby conservation area which is one of the largest fossil sites in England. Fossils dating back as far as pre-historic times are on display. We’re not saying you are an old fossil, but if you need a stairlift, Castle Comfort are the people to call. 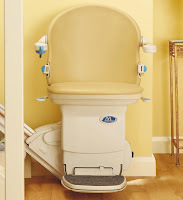 You can check out stairlift prices on our website. Don’t forget you can use our £50 voucher towards the cost and there are also there are also grants available available that you can apply for or the more instant 0% finance option. Give us a call today on 01902 489 422 to arrange a visit to assess your stairs and to ask any other questions you might have. We look forward to hearing from you. Dudley Castle is allowed to use the word Castle in its title as it existed a long time before Castle Comfort Stairlifts! A long time indeed before. I grew up in Dudley before retiring to the south coast. I still remember the Black Country museum for days out. Not been to the Black Country Museum - what's in it? Any old stairlifts?